Implement single digit BCD adder using 4-bit binary adder IC7483. Show the design procedure & explain its operation. 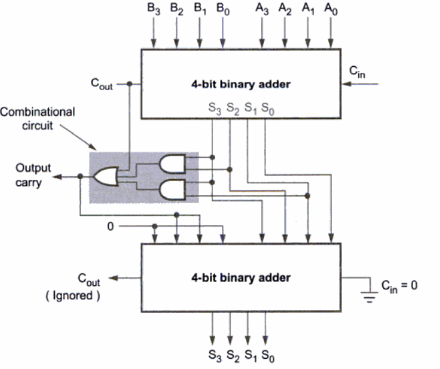 Question: Implement single digit BCD adder using 4-bit binary adder IC7483. Show the design procedure & explain its operation. The digital systems handle the decimal number in the form of binary coded decimal numbers (BCD). A BCD adder is a circuit that adds two BCD digits and produces a sum digit also in BCD. Y=1 indicates sum is greater than 9. We can put one more term, C_out in the above expression to check whether carry is one. If any one condition is satisfied we add 6(0110) in the sum. With this design information we can draw the block diagram of BCD adder, as shown in figure below. As shown in the Fig, the two BCD numbers, together with input carry, are first added in the top 4-bit binary adder to produce a binary sum. When the output carry is equal to zero (i.e. when sum <= 9 and C_out = 0) nothing (zero) is added to the binary sum. 10.When it is equal to one (i.e. when sum > 9 or C_out = 1), binary 0110 is added to the binary sum through the bottom 4-bit binary adder. The output carry generated from the bottom binary adder can be ignored, since it supplies information already available at the output carry terminal.